The subject of Marcus Callum’s portrait is his son Sebastian. ‘This portrait is about transitions, about contemplating a future. Sebastian has an unusual wisdom for his age. He seems to be considering you, the viewer, with an intuitive knowing,’ says Callum. Born in Scotland in 1967, Callum has made Sydney his home. 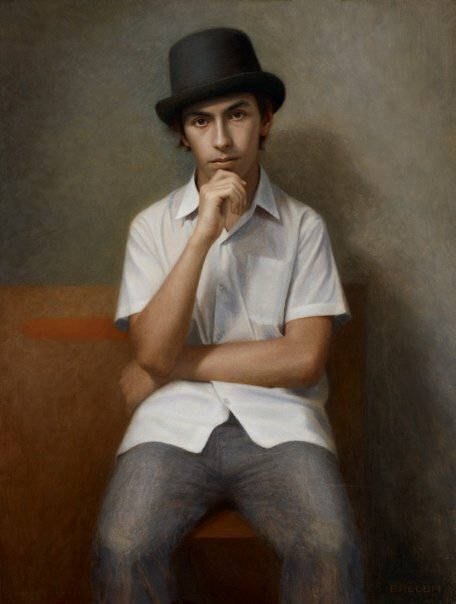 He studied at the Julian Ashton Art School after winning the Sir William Dobell Scholarship and is currently undertaking a Bachelor of Fine Art Honours at the National Art School. Callum has a particular interest in realist portraiture, drawing inspiration from artists such as Ingres, Velásquez and Rembrandt along with many other contemporary artists. This is his third time as a finalist in the Archibald Prize.